How Much of Your Body Weight Do You Lift in a Push-Up? Sure, people do push-ups to tone the pecs, shoulders, arms and even abs, but this not-so-secret weapon also has some less-touted benefits. For one, it encourages circulation, like a good cardio workout. For two, it burns calories. And for three, it builds functional strength (which means strength that actually directly applies to your everyday life). The list goes on, but why is that list there in the first place? 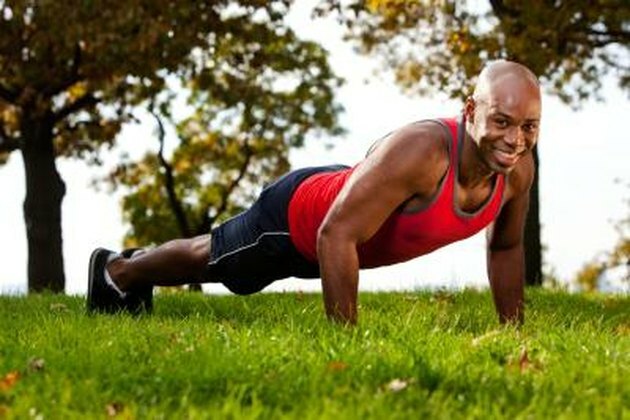 Because push-ups are a body-weight exercise, and that's the distinction that gives them these and other benefits. Though how much you weigh won't take those perks away, some studious fitness experts have even filled us in on exactly how much body weight you're pushing up when upper-body day rolls around. Read more: What Are the Benefits of Push-ups? Fortunately for fitness buffs, kinesiology professor David N. Suprak and his team spilled the beans on push-ups and body weight in a 2011 study published in the Journal of Strength and Conditioning Research. Suprak and crew found that you support 69.16 percent of your body weight in the up position of a push-up, and 75.04 percent in the down position. To illustrate an example, the Centers for Disease Control and Prevention's most recent stats (as of 2016) put the average American male's weight at 195.5 pounds while the average female clocks in at 166.2 pounds. So, at the bottom of the movement—when you're supporting the greatest amount of body weight—the average man holds up about 146.7 pounds, while the average woman supports roughly 124.7 pounds. Suprak's study also found that if you do a modified push-up—the kind where your knees are bent—you lift significantly less body weight. The percentage of body weight in this variation of the exercise drops down to 53.56 percent in the up position and 61.8 percent in the down position. Though many beginners turn to on-the-knee push-ups upon finding the traditional push-up too challenging, taking your legs completely out of the equation almost changes the nature of the exercise. In addition to supporting less weight with your upper body, your lower body is completely removed from the equation and your body doesn't have to work as hard to stabilize your spine or hips. This position might even put unneeded strain on your wrists, elbows and shoulders. Instead of taking a knee, try placing your hands on a bench or chair to perform an incline push-up, lowering your incline by moving on to steps or push-up bars as you become more comfortable. Eventually, you'll be able to hit the flat ground and lift all 75.04 percent of your bodyweight. Are push-ups a part of your routine? Why or why not? And do you find your own body weight challenging enough to push, or do you add extra intensity with the addition of weight plates or a crafty push-up variation? Sound off in the comments below and make your voice heard. The Cooper Institute: How Much Weight Is Really Lifted During a Push-up?